What is it? A 2D stealth combat game with turn-based battles. Inspired by: Gunpoint, Mark of the Ninja, did I mention Gunpoint? Why yes, Ronin does look a lot like Gunpoint. 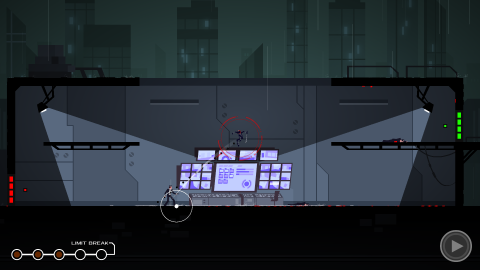 As a 2D action-stealth game set across the buildings of a stylishly futuristic city, the similarities are numerous. You hack computer terminals, use the mouse to plan and execute jumps, and stick to any wall or ceiling you fling yourself against. But Ronin is less derivative than it first appears, thanks largely to the prominence of combat. It looks like a stealth game and sometimes plays like a stealth game, but there are frequent occasions where you're forced into battle. Ronin is first and foremost about fighting, and the turn-based swordplay is what distances the game from its most visible source of inspiration. First, the story. Don't worry, it won't take long. Ronin is about revenge; about a lone figure hunting the five corporate executives responsible for the death of her father. That's about it. Each of the game's five chapters consist of three levels: two in which you infiltrate buildings to hack computer terminals, and a third where you confront and kill that boss. Levels are set across sprawling office buildings, each comprised of a number of self-contained sections. At first, you're unseen—free to lurk in the darkness, taking our guards and planning your opening strike. Sooner rather than later you'll need to jump into the light, at which point you'll be spotted and the action will pause. Each turn of the combat is defined by the enemy's actions. If a red laser sight is pointed at you, on the next turn they'll fire. If they've fired, on the next turn they'll re-aim. That's a bit on the nose, isn't it? You have limited movement potential between each turn. Hold down the left mouse and you'll be shown the arc of your planned jump. If it's fully white, you'll land the jump in a single turn. If there's a red section, that's where you'll stop when the enemy turn begins. The next turn, you'll be suspended in mid-air, forced to either complete the jump or use your grappling hook to transition into a swing. It sounds complicated, but I picked up the flow quickly. The trick is to always be moving. It takes two turns to down a guard: one to land near them, and one to strike them down. Conversely, it takes two turns in the same position to get yourself killed. That's the central puzzle of solving each encounter. The easiest solution is to jump into guards, knocking them down and giving yourself a couple of turns before they recover. This can buy you enough space to start whittling down their numbers. After that, it's a case of learning the system's tricks. The safest way to take down an enemy, for instance, is to plan a turn that ends with you suspended above their head. The other guards will take aim at your mid-air position, but, as long as you're within range of the kill, your character will land and perform an execution in one swift movement. With your elevation now changed, the bullets will fly harmlessly overhead. At a basic level it's an enjoyable system to manipulate, and enhanced by a number of unlockable skills. These are tied to a limit break meter that builds as you stun and kill guards. Let it fill completely, and you're given a free action. More often, it's worth spending your accrued points on a potentially life-saving special move. By the end of the game, I could create decoys, throw my sword, and send out a circle of daggers that would temporarily down all visible guards. There's some slapstick in there, too. A teleport skill lets you instantly slam into any visible enemy to send them flying. If they're stood by a window, this skill is an instant defenestration button—a fine thing for any game to have. As I grew more familiar with the combat, inconsistencies became more apparent. For starters, you don't always have enough information to effectively plan a move. The jump tracer doesn't account for enemies, so it's difficult to know where you'll end your turn if you go for a stun—an omission that led to my death on more than one occasion. Invisible, Inc proved the worth of complete transparency in turn-based feedback, and it's a lesson I wish Ronin had learnt. It's an instant defenestration button—a fine thing for any game to have. More frustratingly, the inflexible turn times mean it's difficult to fine-tune your approach. It's something that would be less annoying if Ronin wasn't so generous elsewhere. Ronin runs in real-time outside of combat, but lets you pause at any moment to plan and execute moves. This enables some spectacular feats of acrobatics, absolutely achieving the game's attempt to express balletic, fluid action through stop-and-start systems. It's so compelling that I found myself staying in stealth as long as possible, using (and arguably abusing) the real-time pause function to leave macabre monuments to silent execution. Outside of combat, I can pause, plan a jump, pause, place the grappling hook, pause, instantly reel myself in, pause, plan a new jump. In this way, I'm able to traverse small slivers of darkness to remain unseen. In combat, I can pause, plan a jump, and then can make no further tweaks until the next turn. It has to be a jump, too: there's no running or climbing in combat. I suspect the limitations are a necessary trade-off to keep the difficulty intact, but they seem to undercut the game's own fantasy. There are some structural issues, too. Each level has three optional objectives: don't kill a civilian, don't trigger a lockdown, and kill all guards. Except, they're not really optional. You need to complete all three to earn a skill point used to unlock Ronin's best toys, and that means you're incentivised to re-try each checkpoint until you've completed that section of level perfectly. It's the skills that give Ronin's combat its tactical diversity, and keep it worth playing across fifteen levels of largely similar encounters. With a growing collection of skills, Ronin stays interesting and engaging. The level design is largely excellent, and offers plenty of varied scenarios across the fifteen missions. But there are only a handful of different enemy types, and so it seems counter-productive to lock away the best toys behind ostensibly optional and occasionally frustrating objectives. Ultimately, Ronin doesn't live up to the quality of its inspirations, but then, it doesn't really need to. It's an entertaining, violent and stylish romp; the schlocky B-movie to Gunpoint's more cerebral stealth-puzzling. The combat feels fresh and distinct, and, while it's not an unqualified success, it does enough to make for a fun four-to-six hour campaign of gratifying swordplay.